– Narrative writing assignments in general stimulate reflection on the topic of our food systems and how they relate to society, families and individuals. – Students can seek out and reproduce individual or collective “food stories.” This can be done by interviewing family members, chefs, farmers or others about food production, preparation or consumption. – Letters to the Editor or to legislators about food systems issues are useful exercises for persuasive or argumentative writing. 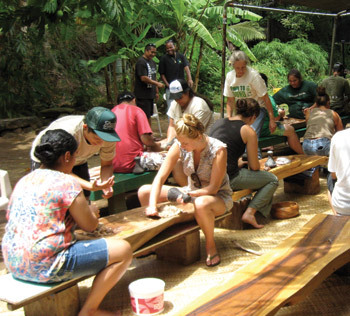 Hawai‘i’s food systems, food security and food sovereignty are rich topics for research papers, and sifting through the variety of sources available – scholarly, oral or media – helps to teach information literacy and critical evaluation of source material. – History students can analyze the differences and similarities between different agricultural industries in Hawai‘i, such as plantation agriculture and today’s seed crop industry. – Debate and/or role-playing exercises help students to explore and assess various sides of the GMO issue. Sample debate topics might include: GMO moratoriums on indigenous food staple plants like taro; corporate funding for public university research; whether or not GMO labeling is just a consumer choice issue, or if government regulation should be involved; whether the planting of GMO test seed crops on designated agricultural lands in Hawai‘i should be permitted; etc. – Students can make qualitative and quantitative comparisons between GE and non-GE foods, both as crops in the field and in their final form as a food product on the market. – Biology and chemistry students can study the impacts of chemical inputs on different agricultural and ecological systems, including air, water and soil quality. – Math or economy students can collect and analyze statistics related to the impact of GE agriculture on human health, economies of scale and the environment. – Economy students can employ the concept of the “triple bottom line” that considers social and environmental health along with economic success to assess different agricultural systems. – There are a variety of curriculum resources that can be used for assigned reading and viewing, including a number of high quality documentary films produced in the last decade on these topics. Please see our Publications, Video and Organizational resource pages for more information.